Colour VQA Wines from B.C. - Write for Wine: It's Wine O'Clock Somewhere!Write for Wine: It's Wine O'Clock Somewhere! Soon after VQA came into play, Margot, who was born and raised in Vancouver, moved to the United States. So this B.C. Colour tasting was particularly meaningful and eye-opening. We discovered some delightful new finds, which we intend to purchase in the future. We enjoyed some palate-pleasing Cabernet Franc, red blends and Pinot Noir, in addition to crisp Sauvignon Blanc, Rosé and Pinot Grigio. Of the wines we tasted at Colour, here are our top 15 wineries (in alphabetical order). 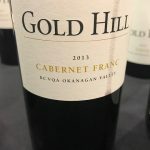 A true-to-character fine Cab Franc from the Okanagan Valley, this was one of the first wines we tasted and loved immediately. 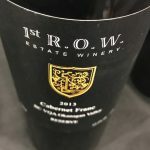 1st Row has a tasting room in Surrey that is currently closed for renovations. Once it opens again, we plan to visit, since we live about 20 minutes away, just a few miles south of the border. What a fun name, label and approachable wine! This is a lovely blend of Merlot (39%), Cabernet Franc (33%), and Syrah and Cabernet Sauvignon (14% each). Bring out the juicy burgers to pair with this bright, rich wine. 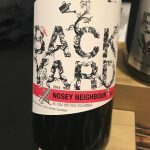 We were pleased to discover that Backyard Vineyards’ tasting room is in Langley, so we hope to stop by there as well. 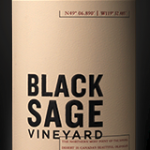 Based in Summerland, Black Sage is known for its robust reds. This is 96% Cab Franc topped off with 4% Merlot — you’ll find aromas and flavors of cherries, strawberries, earth, tea leaves, vanilla and red fruits. This is a medium-bodied red, which will pair well with roasted or grilled meats, pork, ribs or tomato-based pasta dishes. Located 20 minutes from downtown Kelowna, CedarCreek sources its red grapes from their estate vineyards in Osoyoos. This is 100% Merlot, brimming with notes of blackberries and violets, with some minerality. 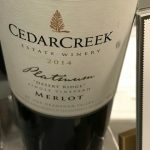 We were not surprised to hear that this Merlot won a Gold Medal at the 2017 B.C. Wine Awards. This is a very popular wine in Canada, generating accolades from critics and the media. This new vintage — a blend of Merlot, Cabernet Sauvignon and Cabernet Franc — won praise for its elegance, refinement, power and sophistication. We loved it too. 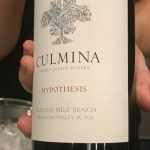 Culmina’s tasting room is located south of Oliver. This is our idea of a perfect Sauvignon Blanc — crisp and refreshing, with aromas and flavors of grapefruit and other citrus, white peach and lemongrass. We will definitely buy some to sip on our lakeside deck next summer but until then, it will pair well with salmon, scallops and other seafood dishes. 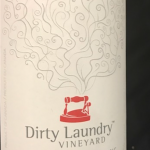 Dirty Laundry’s tasting room is in Summerland. 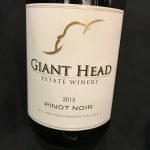 Also located in Summerland, Giant Head makes one of the best Pinot Noirs we’ve tasted. The 100% estate-grown Pinot Noir displays classic flavors typical of the variety. I wish we had this beauty to pair with turkey when we celebrated Canada’s Thanksgiving, but luckily the U.S. Thanksgiving offers another opportunity. We also enjoyed this winery’s Merlot rosé. It makes a perfect summer sipper, but will also pair well with spicy foods anytime. Next time you drive along the Golden Mile fruit belt between Osoyoos and Oliver, check out Gold Hill Winery. They offer many award-winning wines, and we particularly appreciated their beautiful Cabernet Franc. It features a medley of aromatics and flavors such as cocoa, spices, licorice, herbs and some minerality. 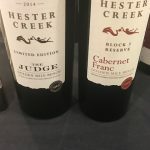 Two captivating reds from well-known Hester Creek in Oliver captured our attention at Colour. The Judge blends Cabernet Franc, Cabernet Sauvignon and Merlot, while the Cab Franc is sourced from Block 3, some of the oldest vines on the estate. Both wines are full, rich and intense – we loved them. This robust, beautiful Meritage was one of our favorite wines at the Color tasting. The big red wine blends Merlot (81%) with Cabernet Sauvignon (15%) and 2% each of Malbec and Cab Franc. The Pinot Grigio is a pretty white wine with flavors of orange blossom, pears and honeysuckle. 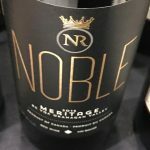 Noble Ridge Vineyard & Winery is in the Okanagan Valley at the northern- most tip of the only desert in Canada. Overlooking Skaha Lake in the Okanagan Valley, Painted Rock poured several good wines at Colour, but our favorite was Red Icon — a blend of Merlot (45%), Cabernet Franc (24%), Malbec (11%), Petit Verdot (11%) and Cabernet Sauvignon (9%). Not surprisingly the result is bold and juicy, bursting with flavors of dark fruit, pepper, spices, vanilla and chocolate. 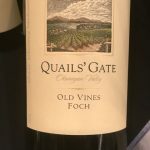 Quails’ Gate Old Vines Foch was the first B.C. wine that Margot introduced to Dave 20 years ago, so it has a special place in our hearts. We love this wine; this vintage is luscious and lovely, with notes of dark fruit, cranberry, smoked meat, spice and coffee. We can’t wait to try 2015 Old Vines Foch Reserve. Located in Kelowna, Quails’ Gate is one of Canada’s foremost family-owned estate wineries. 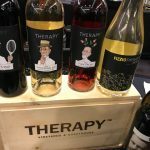 Don’t let the lighthearted designs and labels on Therapy’s bottles distract you from some seriously good wine. The Sauvingon Blanc is crisp and refreshing, based on the New Zealand style of the variety. Green, grassy notes highlighted with citrus aromas and flavors, this wine will be perfect therapy as a summer sipper, or during dark winter days when you are looking forward to next spring. You’ll find Therapy overlooking Okanagan Lake. Double entendre intended. Last but definitely not least, our old friend, Tinhorn Creek recently released a new flagship wine that we were delighted to taste at Colour. The Creek blends Cabernet Sauvignon (53%) with Merlot (19%), Cab Franc (17%), Malbec (9%) and Petit Verdot (2%). This is an elegant, luxe wine, which Tinhorn Creek describes as a toast to 23 years of experience in farming and winemaking on the southern Okanagan Valley. 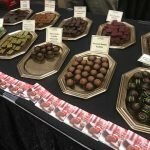 We’d also like to give a shoutout to Daniel Le Chocolat Belge for beyond-delicious chocolate to sweeten the Colour event. Wow, these were scrumptious! 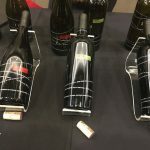 Thank you, Wines of British Columbia, for inviting us to this tasting and to the earlier wine seminar “B.C.’s Wild Side” described in a separate post. We plan to continue our B.C. wine experience in the weeks and months ahead. This entry was posted in Bordeaux Blend, British Columbia, Cabernet Franc, Cabernet Sauvignon, Malbec, Merlot, Petit Verdot, Pinot Gris, Pinot Noir, Sauvignon Blanc, Syrah, Wine, Wine Events and tagged 1st Row Estate Winery, Backyard Vineyards, Black Sage Vineyard, Bordeaux blend, Cab Franc, Cabernet Sauvignon, CedarCreek Estate, Culmina Family Estate Winery, Daniel Le Chocolat Belge, Dirty Laundry Vineyard, estate wine, Events, Giant Head Estate Winery, Gold Hill WInery, Hester Creek, Laughing Stock Vineyards, Malbec, Merlot, Noble Ridge, Painted Rock Estate Winery, Petit Verdot, Pinot Noir, Quail's Gate, Sauvignon Blanc, Syrah, Therapy Vineyards, Tinhorn Creek, wine, wineries, Wines of British Columbia by Margot. Bookmark the permalink.